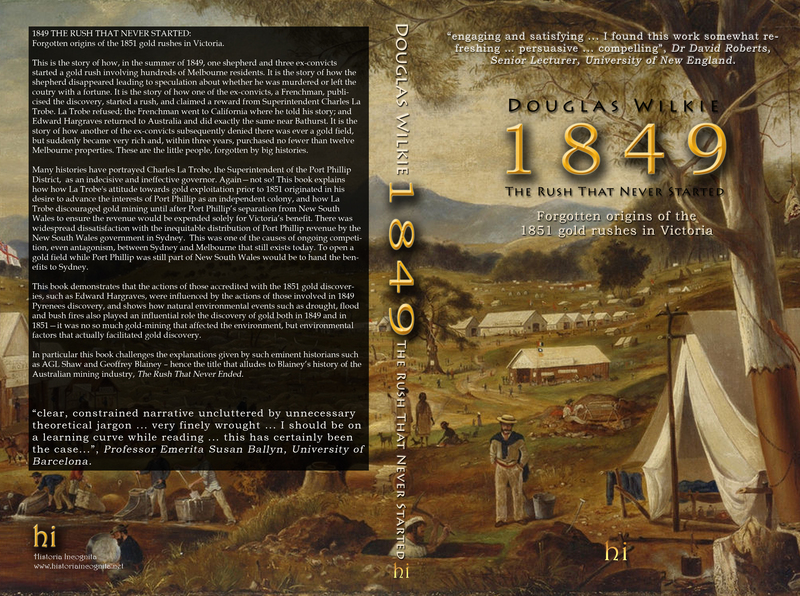 Many people have the impression that the Victorian gold rushes not only began in mid-1851, but also occurred in response to discoveries earlier in that year near Bathurst, west of Sydney. Not so! The Victorian gold rushes of 1851 were a direct consequence of a largely forgotten gold discovery two years earlier in the Pyrenees Ranges of the Port Phillip District. This is the story of how, in the summer of 1849, one shepherd and three ex-convicts started a gold rush involving hundreds of Melbourne residents. It is the story of how the shepherd disappeared leading to speculation about whether he was murdered or left the country with a fortune. It is the story of how one of the ex-convicts, a Frenchman, publicised the discovery, started a rush, and claimed a reward from Superintendent Charles La Trobe. La Trobe refused; the Frenchman went to California where he told his story; and Edward Hargraves returned to Australia and did exactly the same near Bathurst. It is the story of how another of the ex-convicts subsequently denied there was ever a gold field, but suddenly became very rich and, within three years, purchased no fewer than twelve Melbourne properties. These are the little people, forgotten by big histories. Many histories have portrayed Charles La Trobe, the Superintendent of the Port Phillip District, as an indecisive and ineffective governor. Again—not so! This book explains how how La Trobe’s attitude towards gold exploitation prior to 1851 originated in his desire to advance the interests of Port Phillip as an independent colony, and how La Trobe discouraged gold mining until after Port Phillip’s separation from New South Wales to ensure the revenue would be expended solely for Victoria’s benefit. There was widespread dissatisfaction with the inequitable distribution of Port Phillip revenue by the New South Wales government in Sydney. This was one of the causes of ongoing competition, even antagonism, between Sydney and Melbourne that still exists today. To open a gold field while Port Phillip was still part of New South Wales would be to hand the benefits to Sydney. This book demonstrates that the actions of those accredited with the 1851 gold discoveries, such as Edward Hargraves, were influenced by the actions of those involved in 1849 Pyrenees discovery, and shows how natural environmental events such as drought, flood and bush fires also played an influential role the discovery of gold both in 1849 and in 1851—it was no so much gold-mining that affected the environment, but environmental factors that actually facilitated gold discovery. In particular this book challenges the explanations given by such eminent historians such as AGL Shaw and Geoffrey Blainey – hence the title that alludes to Blainey’s history of the Australian mining industry, The Rush That Never Ended. Not only does this story provide a new insight into the origins of the Victorian gold rushes, but also provides a fascinating account of the lives of several key protagonists in the 1849 episode – Alexandre Duchene a Frenchman and a watchmaker; Charles Brentani, an Italian and an entrepreneurial businessman; and Joseph Forrester, a Scot and a silversmith. All were ex-convicts from Van Diemen’s Land And there was Thomas Chapman, the shepherd, and an ‘exile’ to Port Phillip. These were the little people—long forgotten in big histories. This is their story. The narrative that forms the central part the book provides a more nuanced picture of the social, political and environmental connections linking the old pastoral society of 1849 Port Phillip to the emerging minerals based economy of Victoria after 1851 than has previously existed, and explains the circumstances of the Victorian gold discoveries of 1851 in ways that challenge many long-standing traditional explanations.